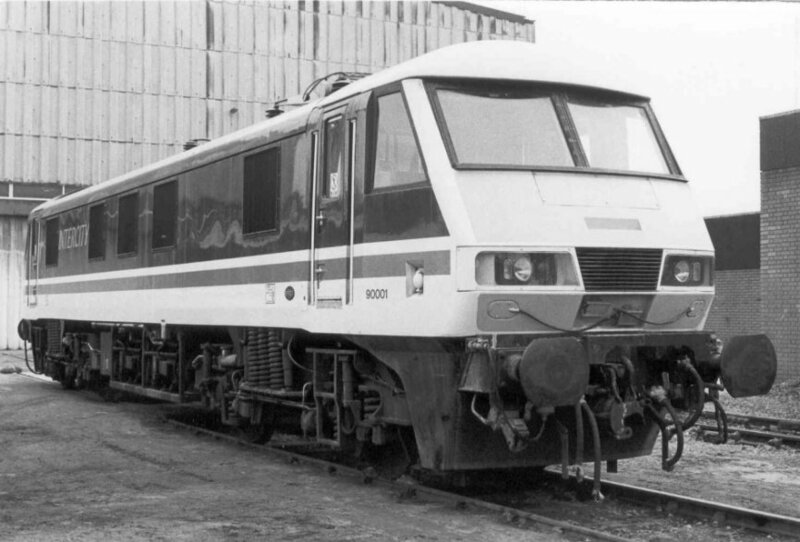 The class 90 bo-bo locomotives were designed to complement the existing Class 87 and in fact were originally designated Class 87/2. 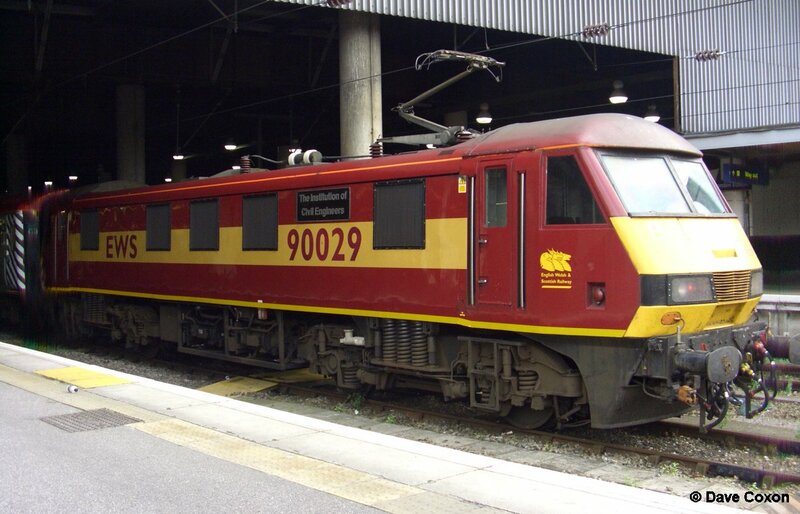 They were designed for both locomotive-hauled and 'Push-Pull' operation and in the latter mode could be operated remotely from a Driving Van Trailer (DVT) vehicle using a Time Division Multiplex (TDM) system of control by which 'signals' are sent through the standard Railway Clearing House (RCH) lighting jumper cables to operate the controls of the locomotive. 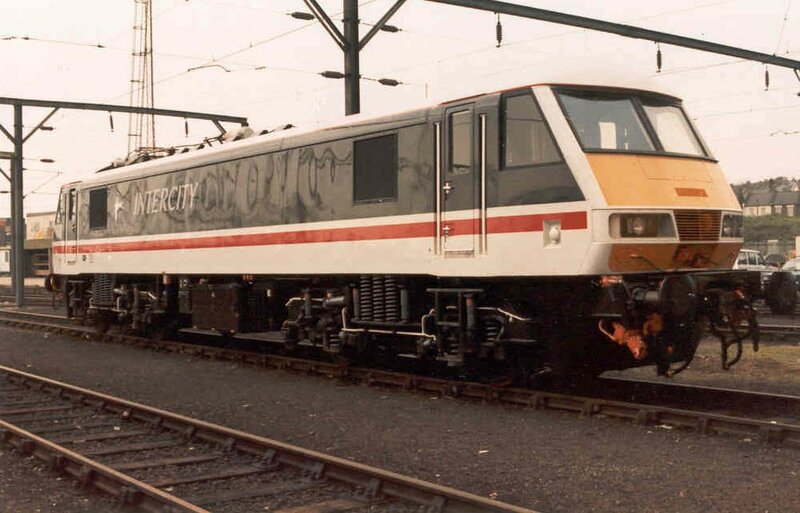 I remember undertaking TDM trials on the WCML with a couple of class 85s and a rake of Mk2 coaches, mainly between Crewe Basford Hall and Stafford. 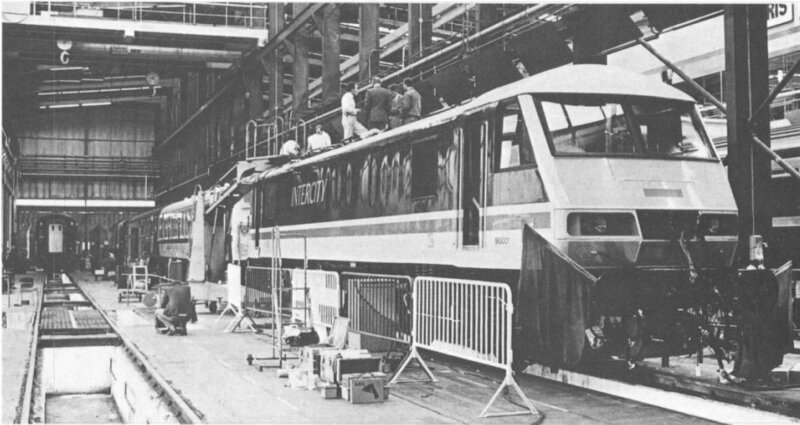 The locos were not permanently fitted for TDM just 'jury-rigged' and monitored. 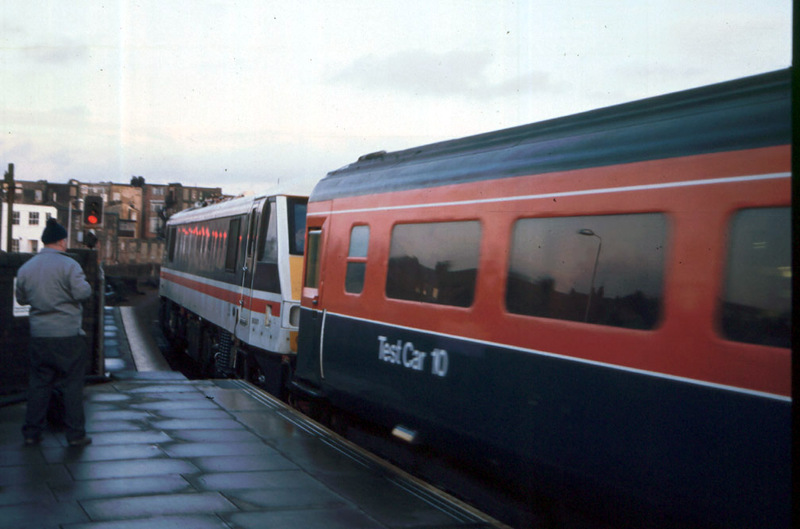 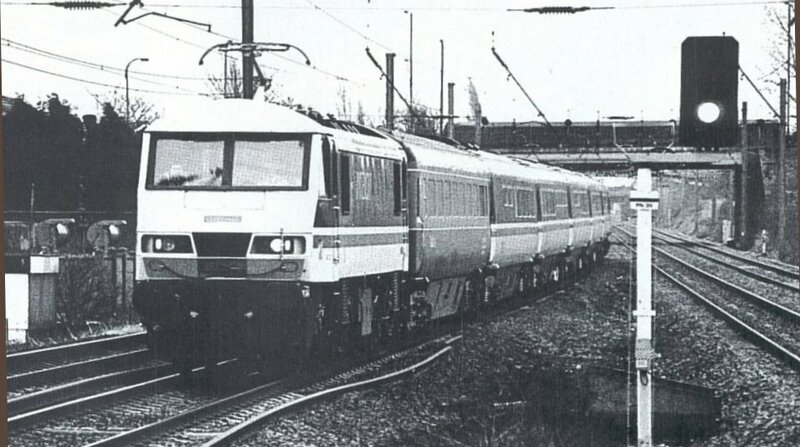 Later when the Mk3 DVTs arrived they were also trialled in a similar way but with a class 86 which would be coming off works fitted with TDM kit. 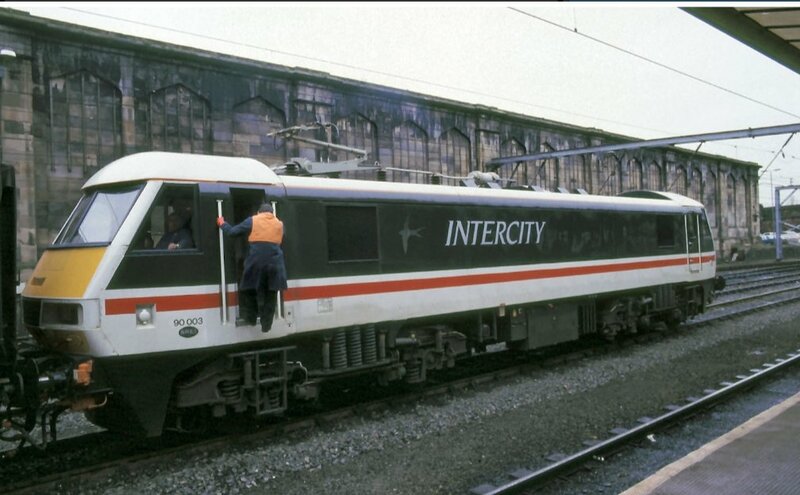 90001 was delivered to the RTC, Derby for trials in late Autumn 1987. 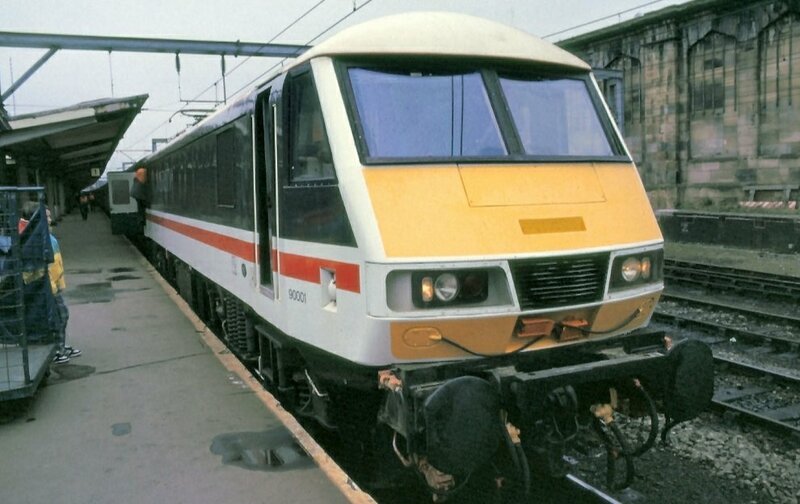 The fleet of 50 locos were introduced onto the WCML in 1988 and I was part of the team responsible for the commissioning of the locomotives. 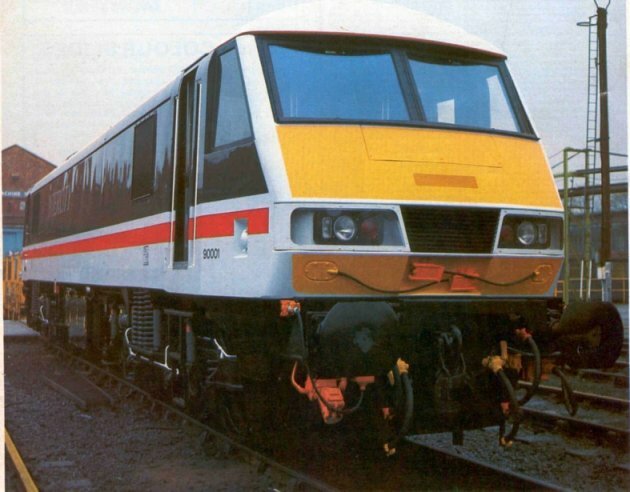 90001 stands inside BREL's Crewe Works on 31st October 1987 prior to being loco-hauled to Derby to commence its type testing. 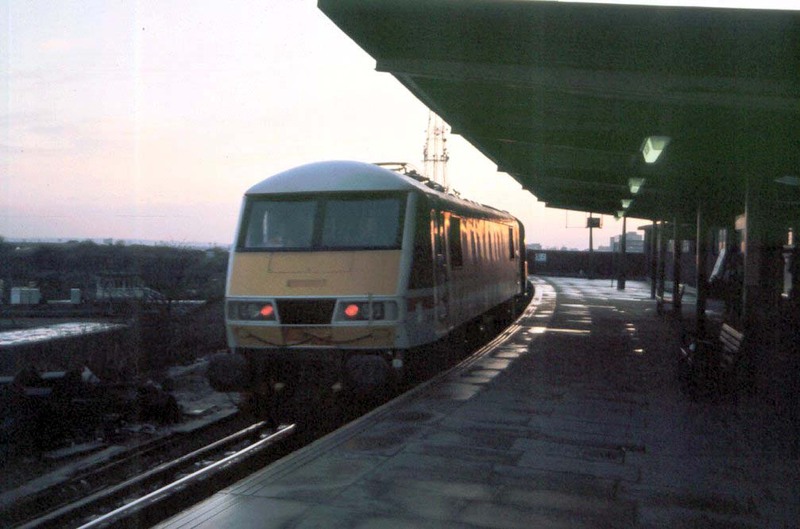 Another shot at Winsford where the Down Slow line would have been under a possession for brake testing. 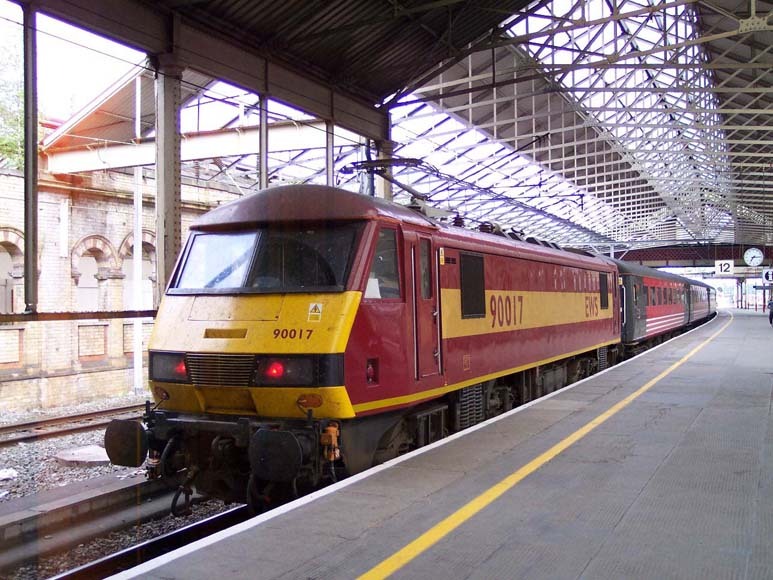 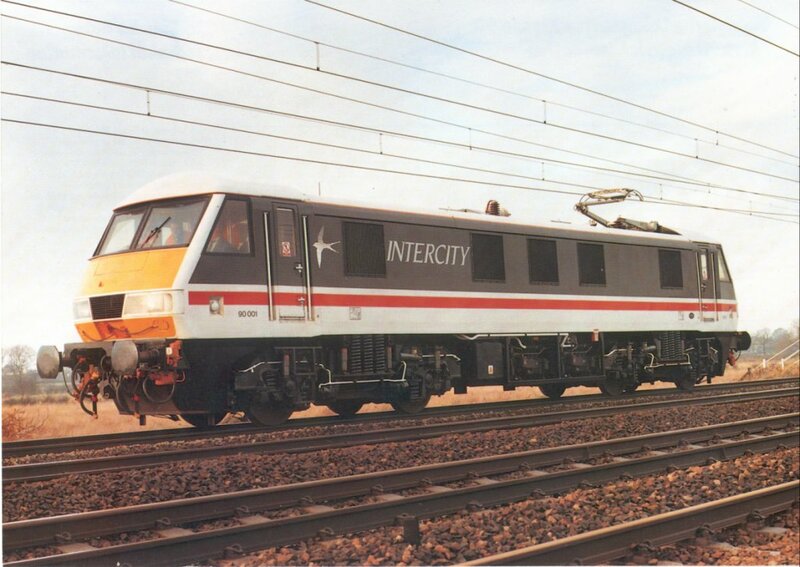 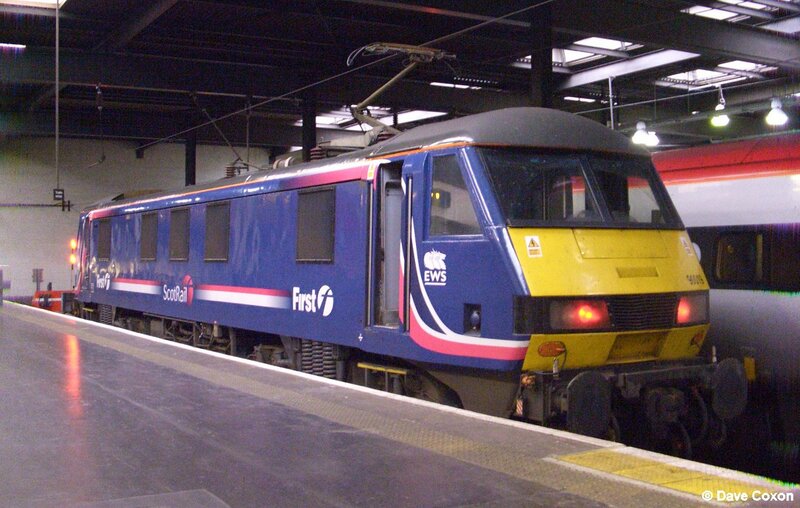 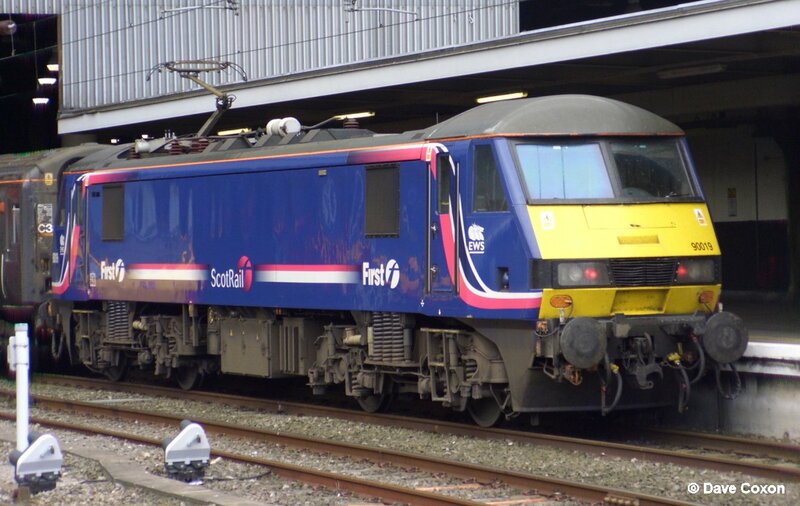 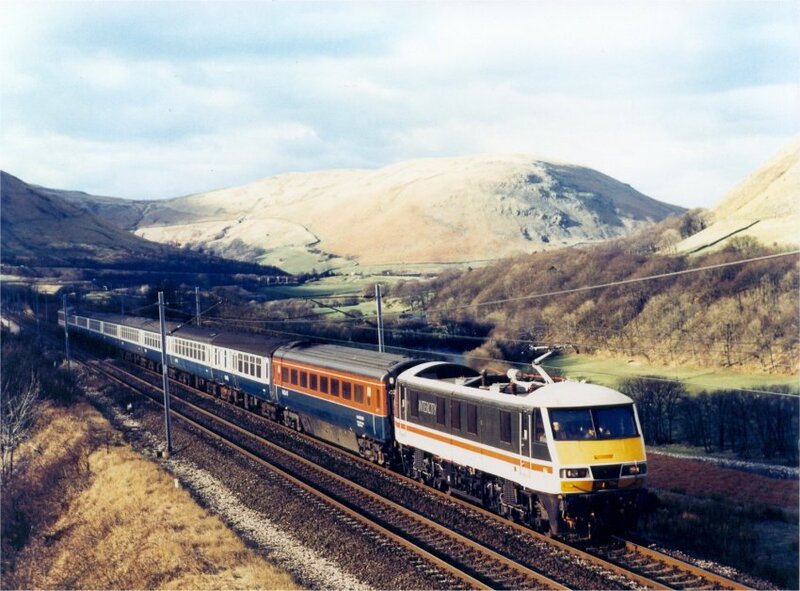 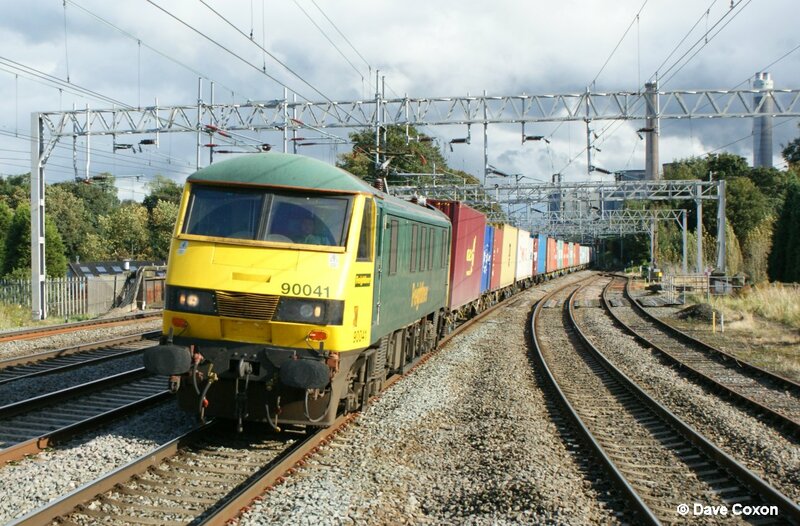 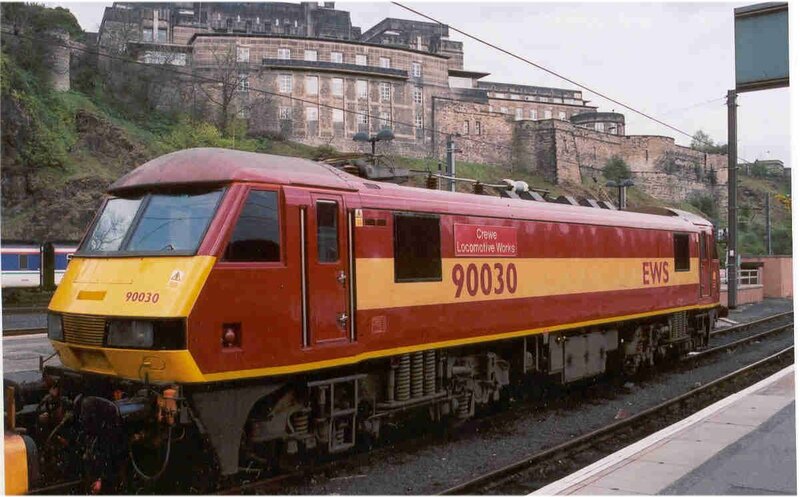 In the early 1990s, with the sectorisation of British Rail, 26 locomotives were dedicated for freight traffic; they were reclassified Class 90/1 and renumbered 90125-150 by the addition of 100 to the original number. 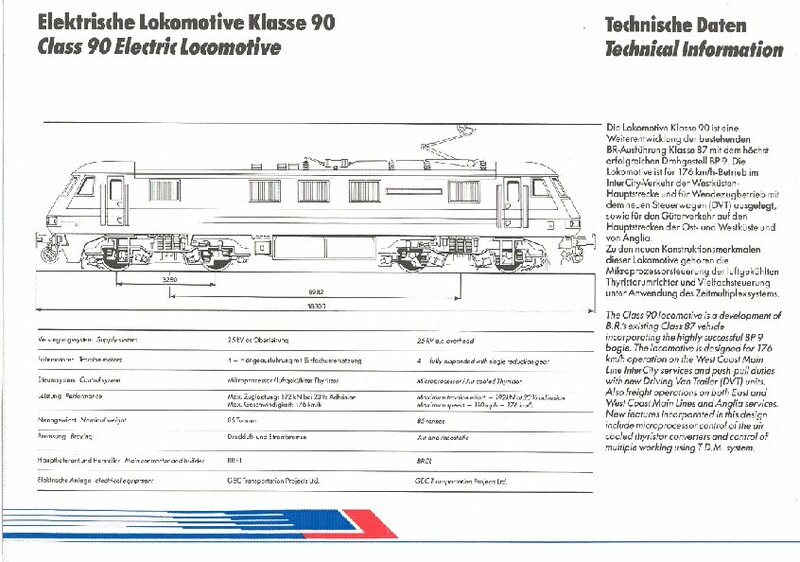 The modifications included lowering the maximum speed to 75 mph (121 km/h) and isolating the electric train supply. 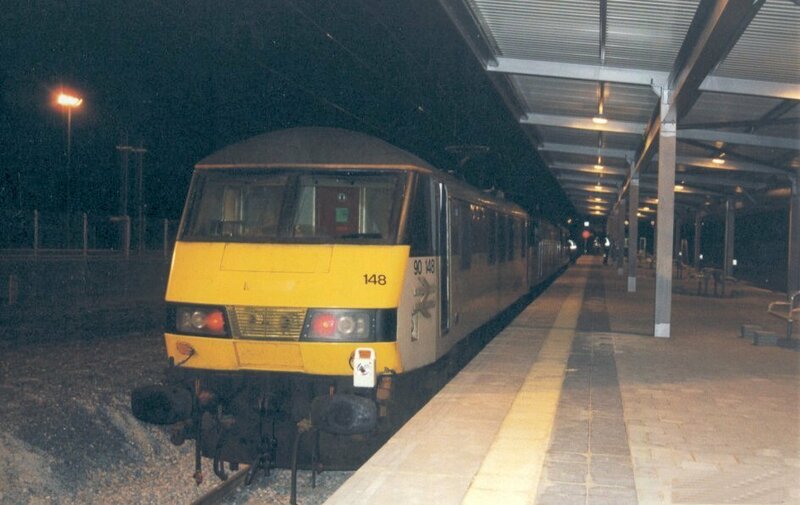 90147 pictured at the temporary station of Stockley Bridge which was erected as part of the Heathrow Express railway - mid-1997. 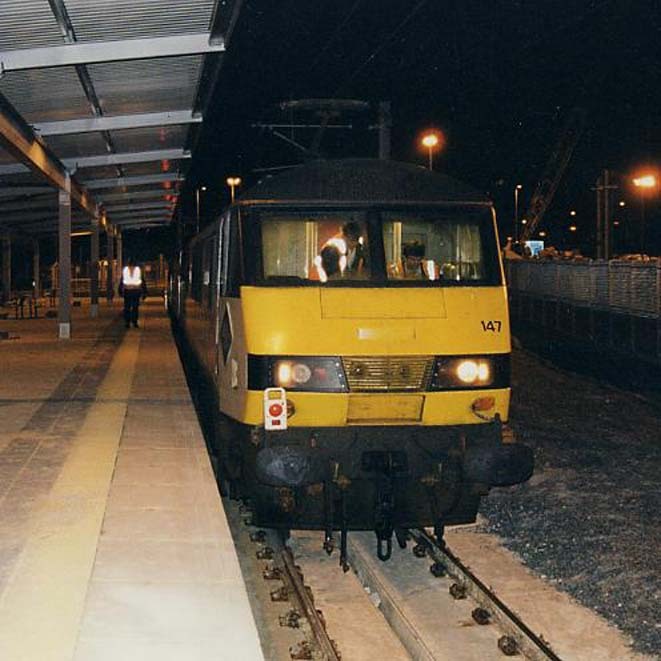 The station was built due to the delays in the completion of the tunnelling work, following the partial collapse during construction. 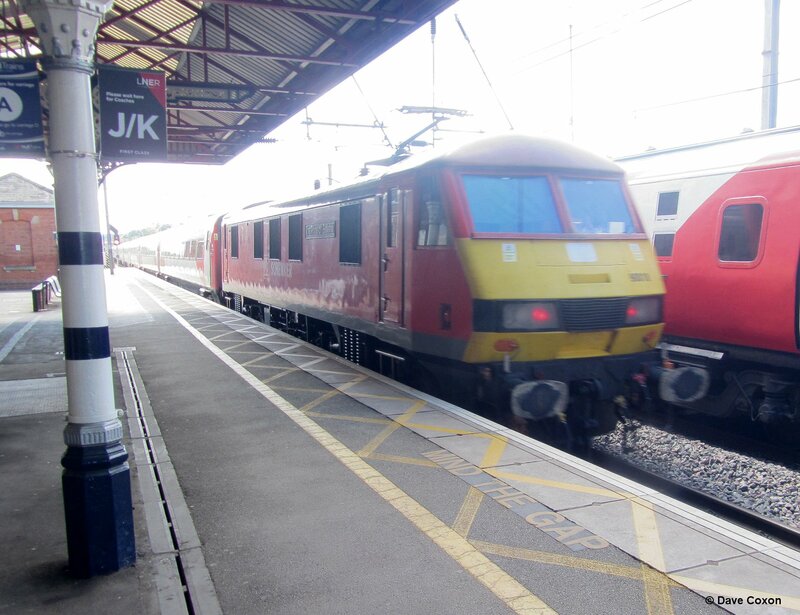 Out of the picture shuttle buses ran from the station to the Heathrow Terminals. 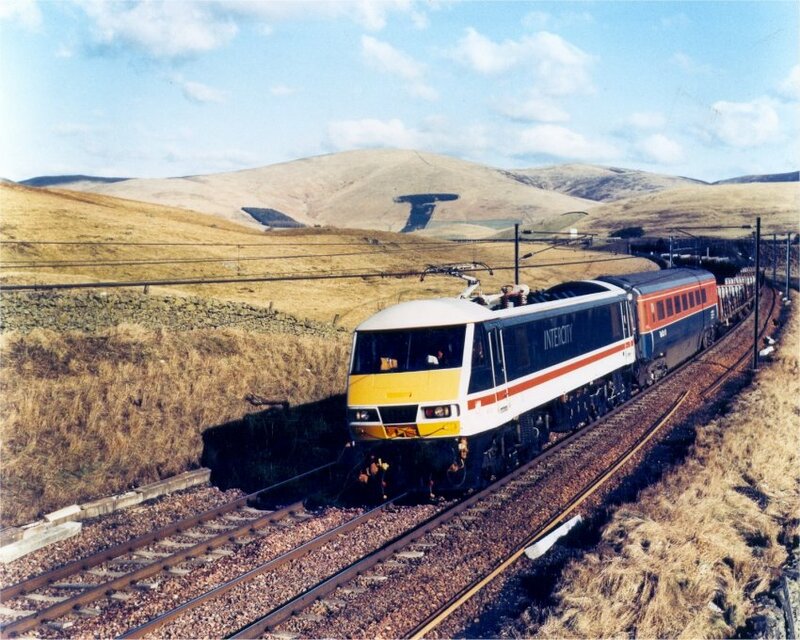 On the right of the picture you can see construction work on the tunnel entrance which was taking place in a cutting behind the locomotive. 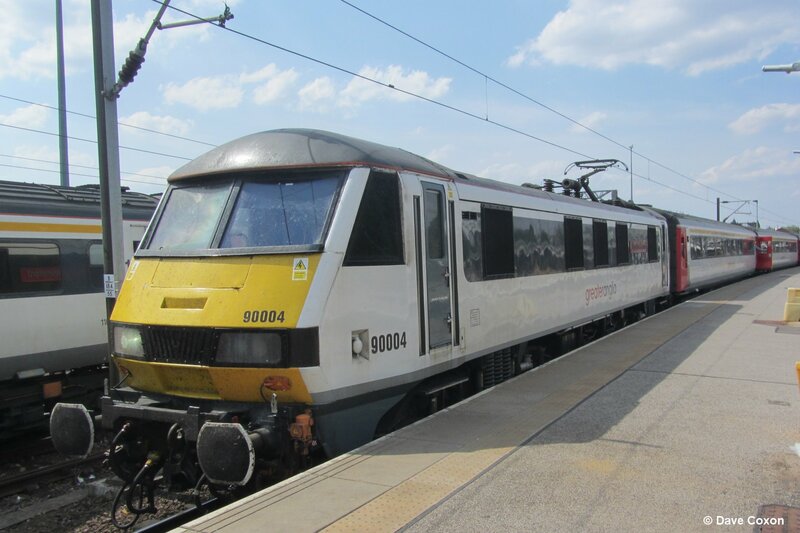 Looking in the opposite direction the pair of class 90/1 locos which formed the test train are pictured in the platform at Stockley Bridge. 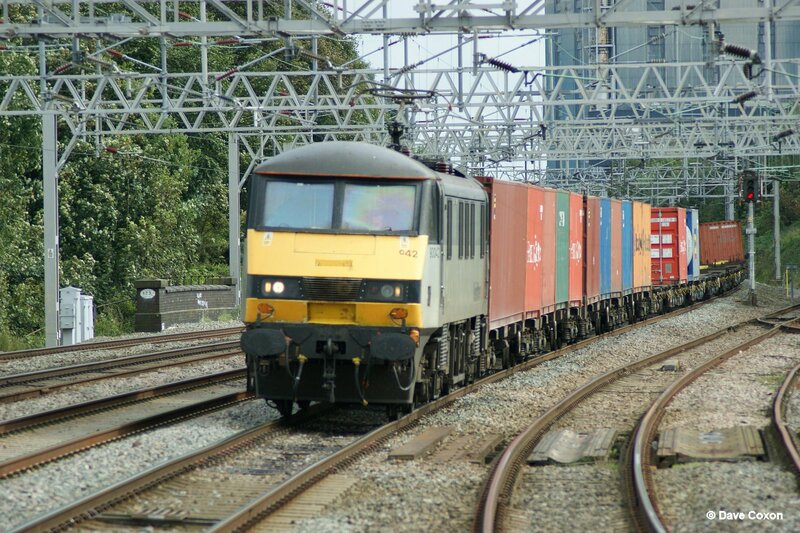 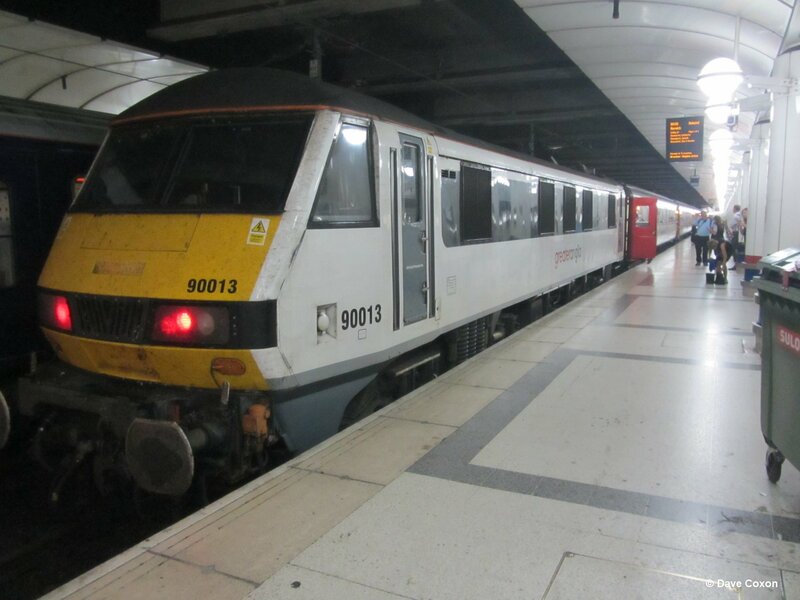 The class 90/1 's were undertaking 'Loadbank tests' to confirm the immunisation of the signal and telecoms on the route and the adjacent London Underground lines around Paddington. 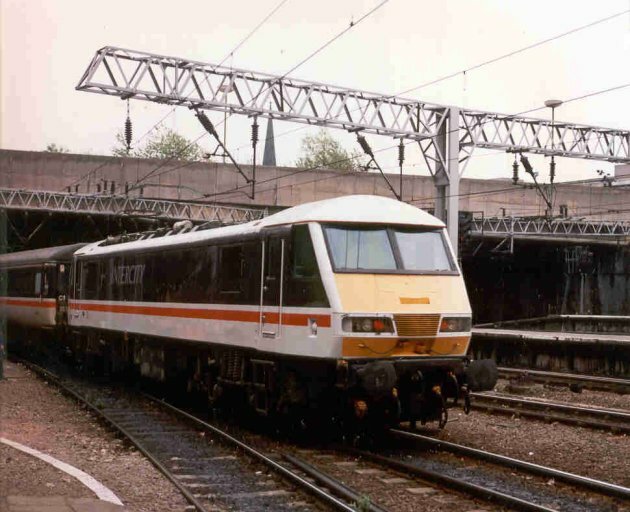 Further tests were undertaken once the tunnels and Terminal stations were opened which included OHLE Test Car MENTOR and the once in a lifetime sight of a Class 90/47/90 combination into Heathrow Terminal 4! 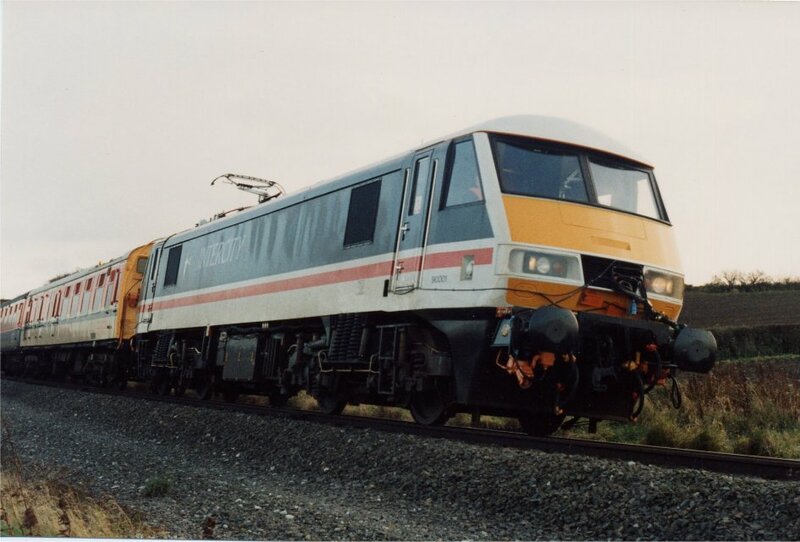 A mega train of four class 90's and a class 67 was put together for a Christmas Day 2001 loadbank test at Corey's Mill, near Stevenage and is pictured at Sandy with 90/1 No 90141 carrying a special headboard. 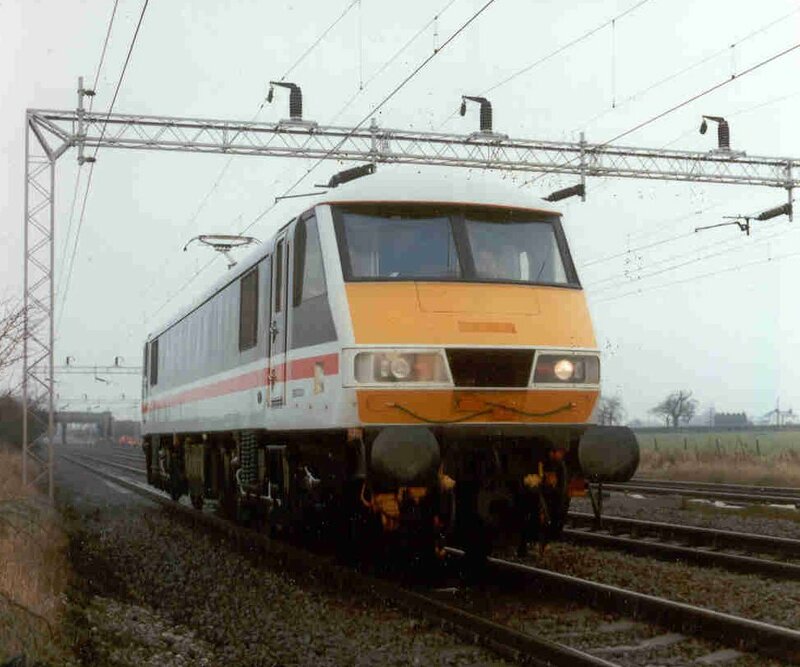 The diesel locomotive was for traction when the OHLE current was not available. 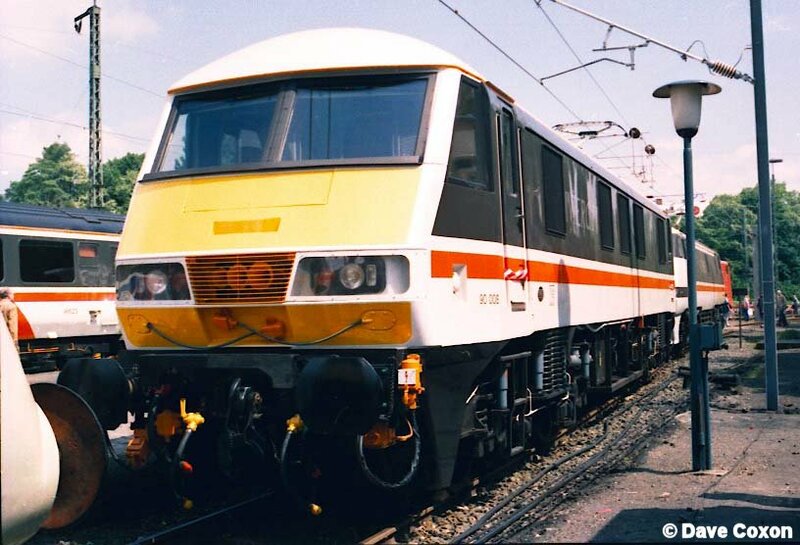 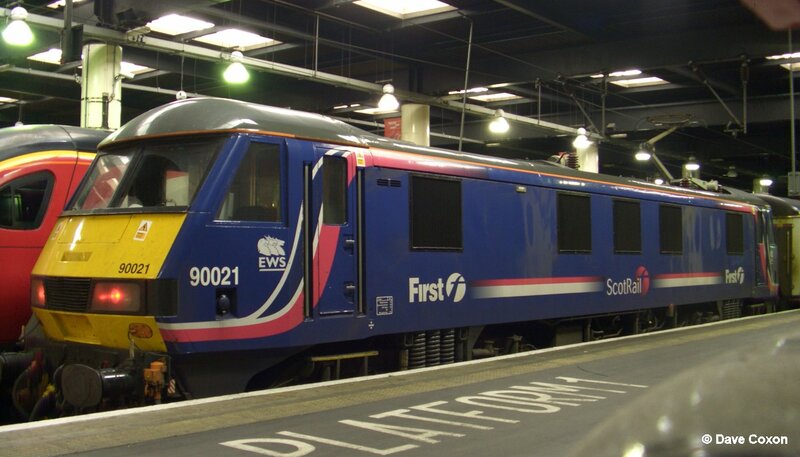 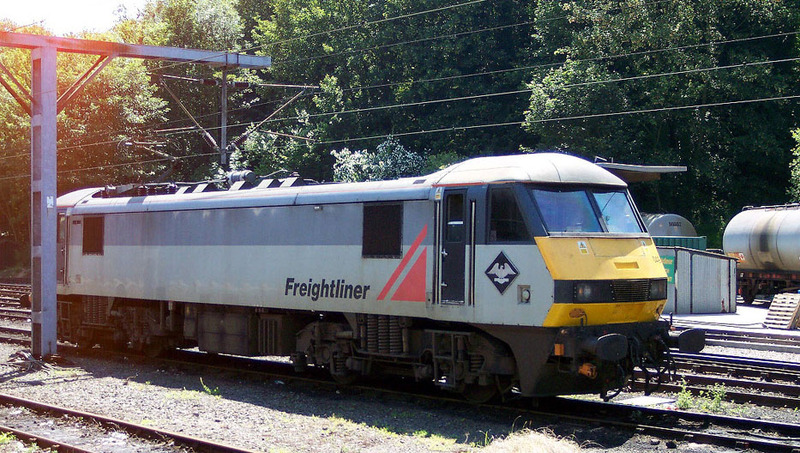 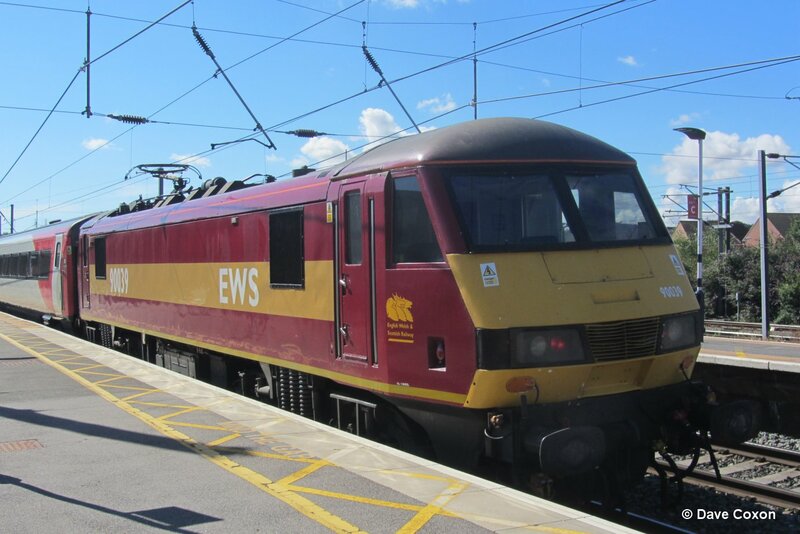 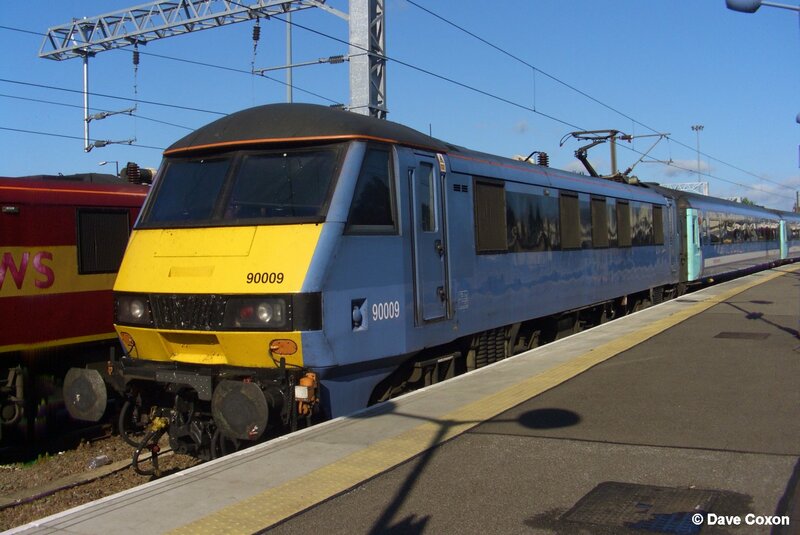 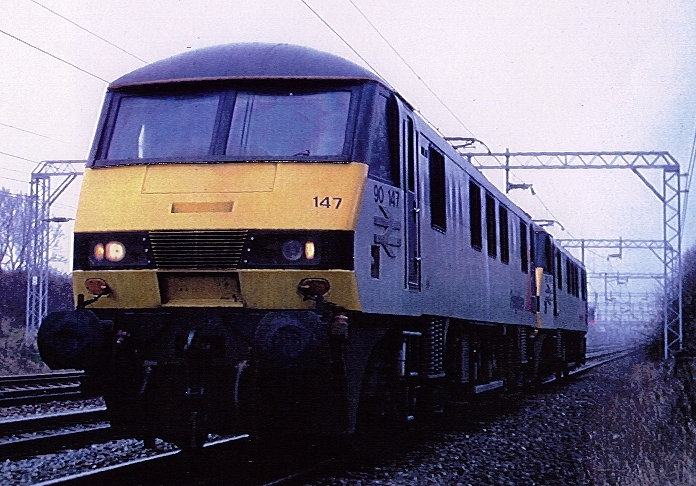 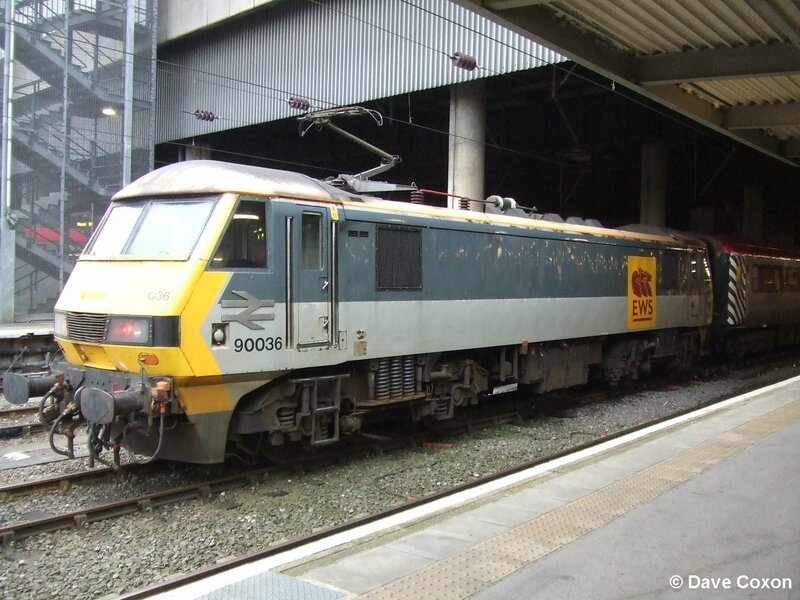 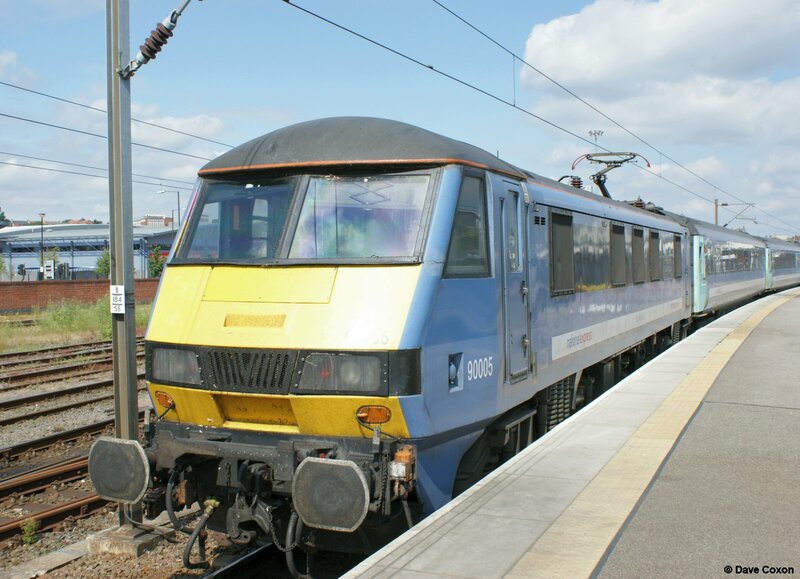 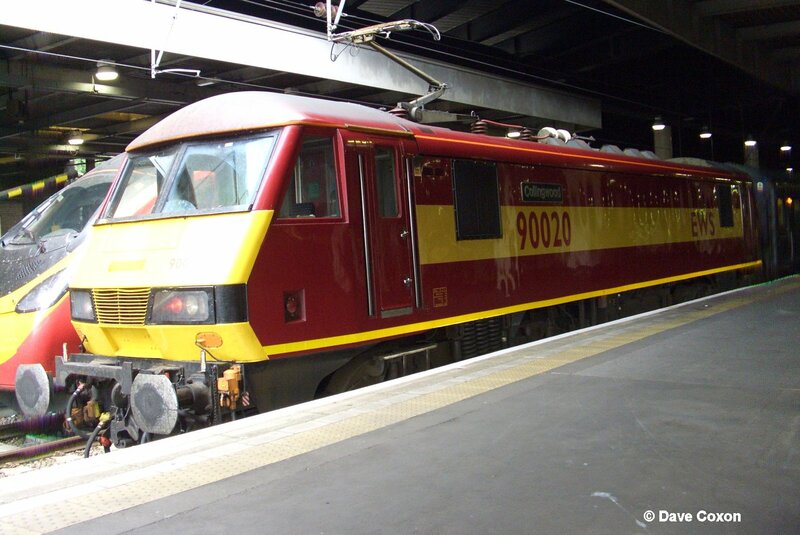 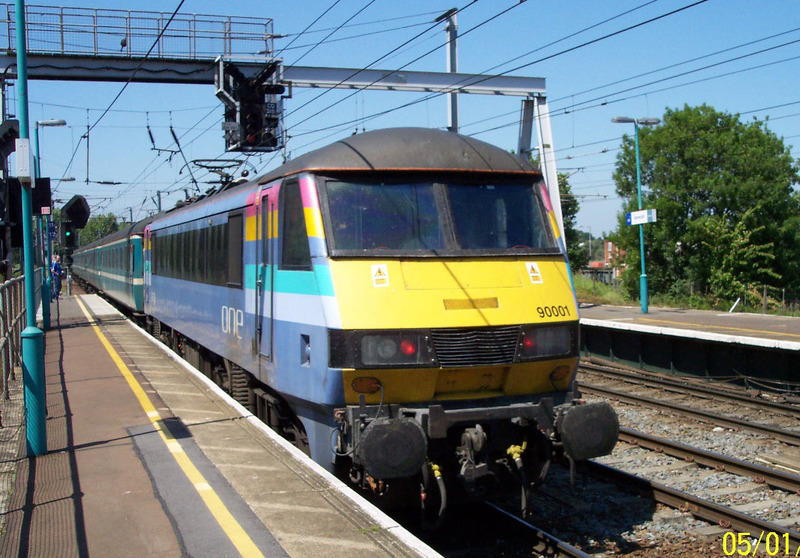 In 1996 Freightliner inherited 10 Class 90/1 locos, These have since been returned to their original Class 90/0 configuration.